We absolutely love making game day appetizers! I always try to put out a good variety for our friends to enjoy and of course creamy onion dip tops the list. Serve it alongside cheesy breadsticks for dippers, BLT Stuffed Tomatoes (recipe below), and bacon devilled eggs (recipe below) for a party spread that everyone will love. I am so excited to partner with Mirum for Hellmann’s, my favorite real mayonnaise, to share these deliciously creamy appetizer recipes. Who doesn’t love a table of nibbles, dippers and snacks while enjoying the game? We sure do! BLT Tomato Bites, Bacon Devilled Eggs and of course a classic Hellmann’s onion dip are the perfect party lineup! 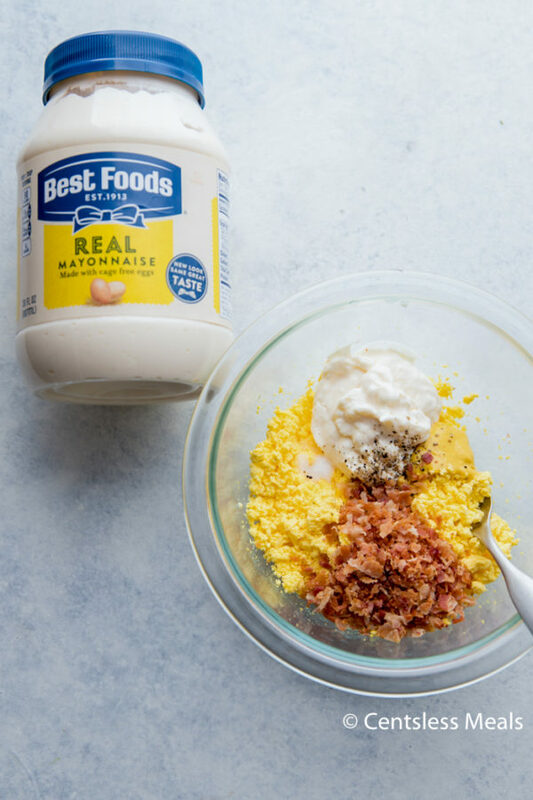 To make things easy, I try to choose ingredients that I can use in multiple recipes, you’ll only need one single jar of Hellmann’s Real Mayonnaise to create all 3 of these easy no bake recipes (and you can make all of them ahead of time too)! Hellmann’s Real Mayonnaise is made with cage free eggs, oil, and vinegar. Not only is it made with real ingredients, it has the best flavor (plus, it’s rich in Omega 3-ALA which is a bonus). It’s the perfect addition to fresh ripe tomatoes and creamy devilled egg filing! These adorable little tomatoes are bite sized bundles of joy. 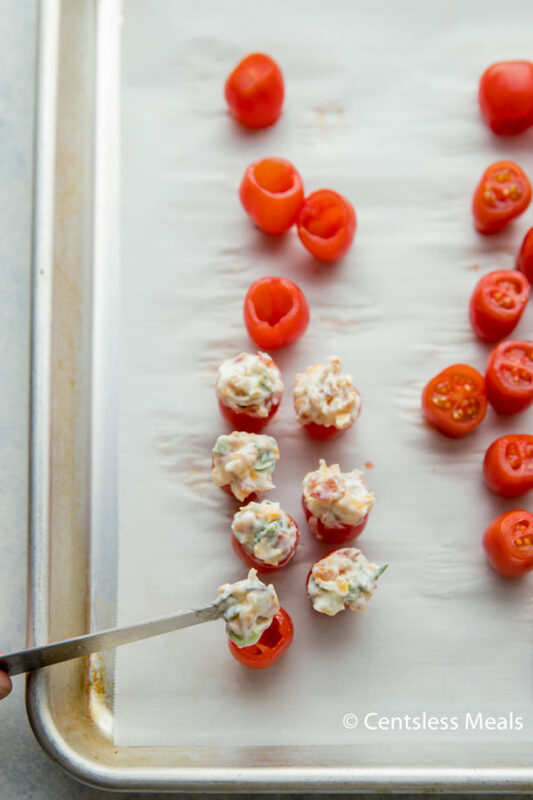 Juicy little tomatoes are filled with a creamy mixture of smoky bacon, mayonnaise and cheddar cheese. 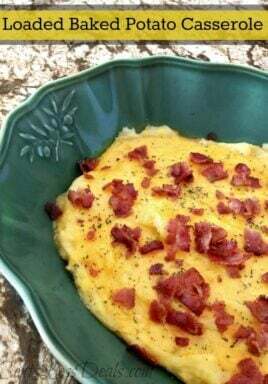 I usually make the entire package of bacon, so I can use some in the devilled eggs recipe below for game day. These creamy bacon cheddar filled tomatoes are the perfect BLT inspired bite and a crowd favorite! Cut the top off of each cherry tomato. Use a melon baller to scoop out the pulp and discard it. Place the tomatoes upside down on a paper towel to drain. Combine bacon, mayonnaise, garlic powder green onions, parsley and cheddar cheese. Fill each tomato with the mayonnaise mixture and chill at least 1 hour before serving. And finally don’t forget these delicious bacon deviled eggs. These can be done in advance too. When starting my party prep, I make these first and chill them while I make the BLT tomatoes and the dip. Everything is ready to serve at once! 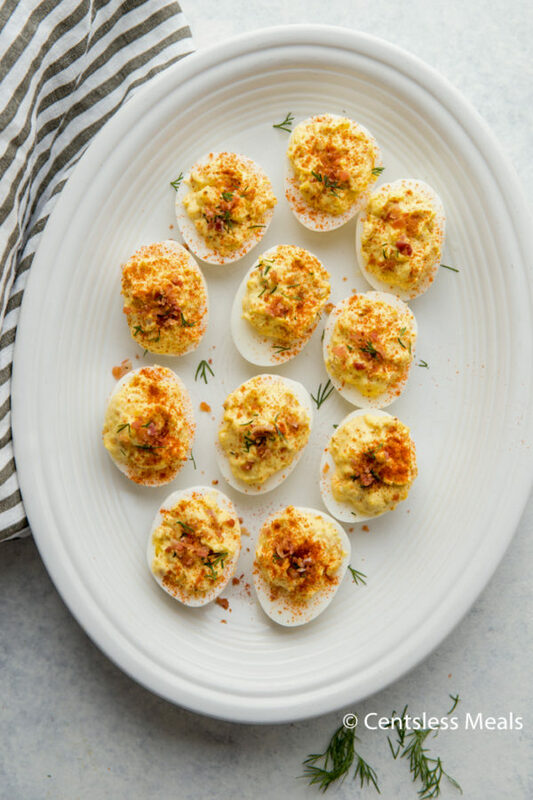 A classic devilled egg recipe is taken to the next level by adding crispy bacon. 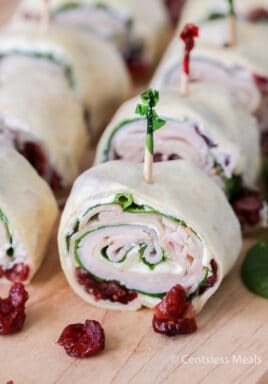 Great for game day, lunches or alongside turkey dinners! 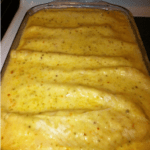 Add in your favorite herbs and seasonings for the perfect creamy bite! Remove the yolks and put them in a medium bowl. Add in mayonnaise, white vinegar, yellow mustard, salt, and pepper. Mix thoroughly. Stir in bacon (reserve a couple tablespoons for garnish). Using a piping bag or a spoon, add the egg yolk mixture back to the whites. Top with paprika, chives, and remaining crumbled bacon. The great thing about this creamy onion dip? It’s totally make ahead, just like the BLT tomatoes and bacon devilled eggs. You can have a game day spread ready the day before it’s even on. What’s better than that? This onion dip recipe below has only 3 ingredients, and needs just a few minutes to make, meaning if you run out, you can just whip up another batch. I save even more time by doing my shopping online. 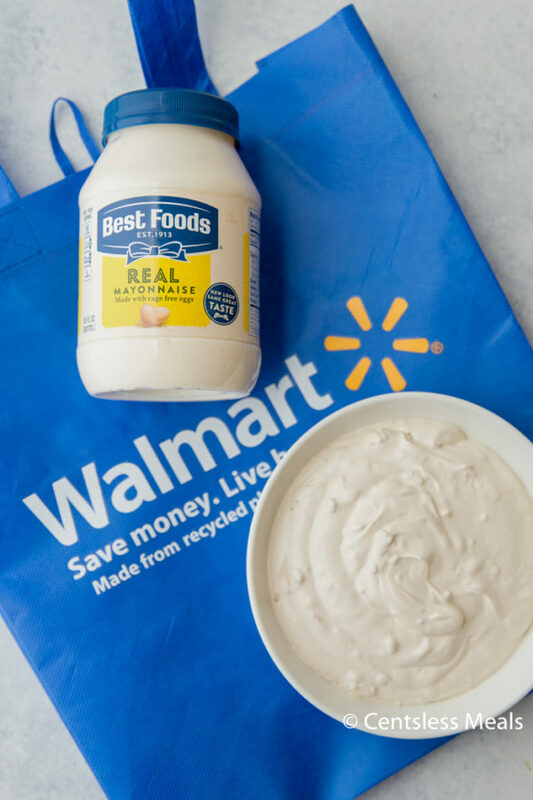 You can grab everything needed at your nearest Walmart (or through the Walmart Online Grocery Pickup) including Best Foods and Hellmann’s Real Mayonnaise, bacon, juicy tomatoes and cheddar. (If you don’t shop online, you can also get both Hellmann’s AND Best Foods Mayonnaise in the condiment aisle and you’ll find Lipton Recipe Secrets in soup/bouillon aisle). All you need to do is combine the ingredients in a bowl, chill, and serve! I like to add a splash of hot sauce to my onion dip for a little bit of a kick, but it’s totally up to you. This dip is a go to for us! We serve it with chips, tortilla chips, crackers and of course with fresh veggies for dipping. Everyone absolutely loves it and once you try it, you’ll know why! Texas Caviar – so fresh! 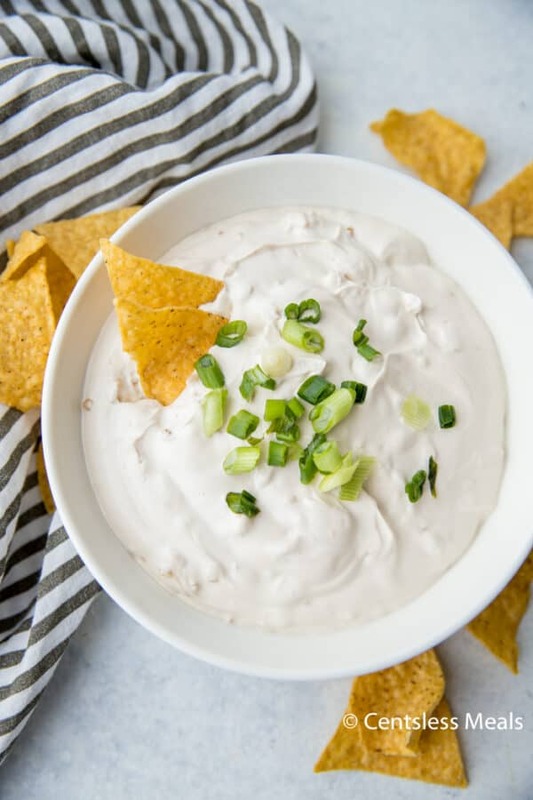 This creamy onion dip is perfect for game day. Mayonnaise is mixed with onion soup mix and sour cream. Serve it alongside your favorite dippers!